City Chatter is another in a growing series of mobile social local apps, and that in turn provides another potential source of promotion for a small business. But will City Chatter be worth paying attention to? While Highlight and Sonar have already done some interesting things in terms of calling attention to all those great small businesses in their individual locales, City Chatter looks to step things up a notch by way of not only providing means to social discovery, but also throwing group chat into the mix. City Chatter is calling itself the “antisocial” network, which is a strange development indeed when many apps are increasing their focus on social networking. But City Chatter is indeed as different as its pitch would imply; City Chatter allows users to check in when they enter a restaurant, store or party, like most others, including Foursquare would. 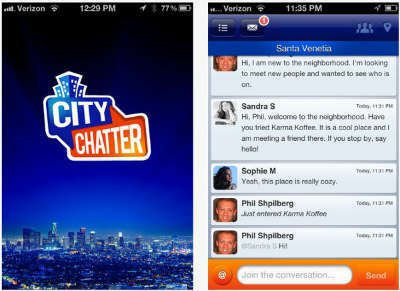 City Chatter will then show users who’s around, and allow them to not only talk one on one with those in the room–even if they aren’t specifically friends–or enter into group chats from there. Users can see each others’ profiles, though privacy settings allow just what’s shown in the profiles to be restricted according to each individual user’s privacy interests. Admittedly, City Chatter only just got started, which means that users may well find themselves dealing with the “empty room” problem in which they have City Chatter on their devices and no one else does, but this is a good opportunity for a small business–especially one that deals with the public–to step in and offer some opportunities accordingly. For instance, a business that promoted that it was City Chatter-friendly might spur some interest. Keeping a device with City Chatter open, such that anyone who walked into the business would be able to see the business’ profile and be able to speak with “the business”, answering questions or the like, would likely gain an edge in marketing. Not only would customers have the opportunity to ask questions quickly, easily, and at any given time without having to have a horde of customer service reps roaming the floor, could prove valuable. While City Chatter may well prove to be a valuable customer service resource, cloud-based telephony systems like instant conferencing and hunt groups will provide the extra shot of incoming contact capability that customer service also needs to make sure those who call in get access to not only the people but also the information they need. The app is both free and currently available at Apple’s App Store. It’s a bit early to decide just how valuable City Chatter will be to your particular small business, but at the same time, it certainly has sufficient potential to make it worth adding to your repertoire of customer contact and enrichment functions. This entry was posted in iOS Apps, Marketing, Small Business by Steve. Bookmark the permalink.